The BVIP is administered by the United States-Mexico Cultural and Educational Foundation, a 501 (c) (3) organization, thus making all financial contributions to the program tax-deductible. Through a corporate sponsorship donation, the Buen Vecino Internship Program is able to send its student participants to private companies and some government agencies that benefit directly form the intern’s bilingual ability and dedicated work ethic. The corporate donations go towards the cost of providing the students airfare, health insurance, and host family stipend, as well as the program’s administration. This highlights another unique aspect of the BVIP in that the students only pay for their personal expenses. The BVIP provides opportunities to talented students who would not have otherwise been able to participate in an exchange program or who have never traveled outside their country due to economic limitations. At the same time corporate supervisors feel that the students contribute significantly to their companies by completing special projects and offering their country’s perspective on different business issues. COFOCE/ Coordinadora de Fomento al Comercio Exterior del Estado de Guanajuato, Leon, Gto. Consejo Estatal de Turismo, Puebla, Pue. El Financiero, S.A. de C.V., Puebla, Pue. Embajada de México, Washington, D.C.
Grupo Editorial Expansión, S.A. de C.V., México, D.F. 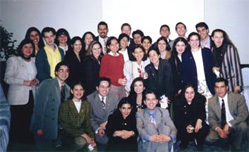 Grupo IMSA, S.A. de C.V., Monterrey, N.L. Grupo PROTEXA, S.A. de C.V., Monterrey, N.L. KPMG Cárdenas Dosal, México, D.F. Mobil Oil de México, S.A. de C.V., México, D.F. Pilgrim’s Pride S.A. de C.V., México, D.F. Seguros Monterrey/Aetna, S.A. de C.V., México, D.F. Volkswagen de México S.A. de C.V., Puebla, Pue.